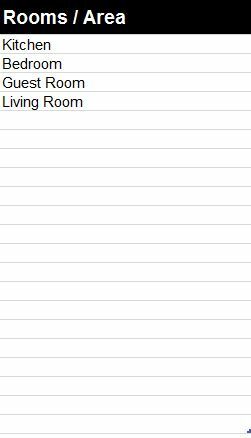 If you own a furniture store, then you know the struggle of keeping track of your inventory. In addition to running or managing a business, you have to worry about keeping accurate data after each sale of your inventory. That’s a hassle but you don’t need to hire someone just to keep track of this information for you. The Furniture Inventory Template is a tool that can help you track this data so you can focus on making your business successful. The free template comes with all the tools you need to enter, update, and store your furniture inventory, which includes: value/sale calculation, a simple design, and a reusable format so you never have to get another inventory sheet ever again. Get started by reading the instructions below to learn how to download and use this free template. You will start by scrolling to the bottom of this page and following the link we have provided for you. This will automatically download the free template file to your computer. You will begin by filling out your store’s insurance information in the table in the top-left corner of the page. The template will automatically give you’re the estimated value of your inventory and keep the current date of your logs at the top as well. So you don’t need to worry about this section just yet. As the business owner or acting manager, you’ll fill out your own information or have the employee filling out the inventory sheet fill it out so you know who updated the furniture inventory template. After you finish entering this information at the top of the page, you will go to the “Room Info” tab at the bottom. It’s a simple table that you can use to fill out the different areas of your store and how you separate the departments of furniture. For example, the “Kitchen” department is where you keep dining room tables, kitchen islands, etc. Now you can scroll down to the main table of the document. Here, we have provided you with an example of how the template will work. This main table is separated into different columns that you will fill out one by one. 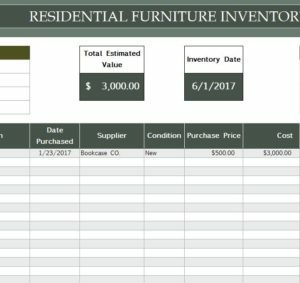 Once you have completed the Furniture Inventory Template, you can scroll back to the top of the page to see the estimated value of your entire inventory. Since I only listed 1 item as an example and put the cost at 3,000 dollars, the calculator will display that amount. This gets a lot more convenient when you have your entire inventory listed on this template. This free template makes it easy for small businesses to keep track of their furniture inventory throughout the year without spending a dime. Get started by following the link below.